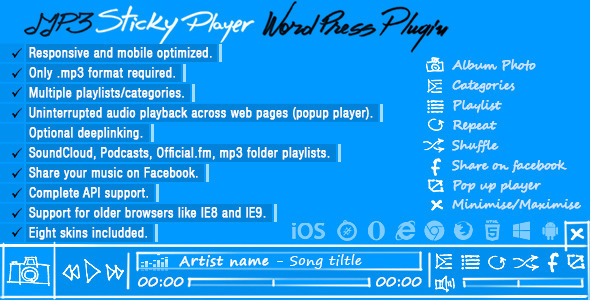 What is MP3 Sticky Player Wordpress Plugin? MP3 Sticky Player Wordpress Plugin is a powerful responsive HTML5 mp3 player for your wordpress website that can be added at the top or bottom of the window, it runs on all major browsers and mobile devices like iPhone, iPad, IOS, Android, Windows8. MSP supports unlimited playlists and each playlist can have unlimited tracks. There are five playlist types, the first playlist type is the normal type that allows to add tracks (mp3’s files) with a high degree of customization, the other four playlist types can be created with a single data source URL that can be loaded from Soundcloud, Official.fm, Podcast or generated from a folder with mp3 files. Packed with a huge amount of features like, external API, deeplinking, popup window and facebook share button, it is one of the most impressive HTML5 mp3 players available on sale. Responsive layout. Mobile and desktop optimized (iPad/IOS demo or Android demo!). Only mp3 file required. Uninterrupted audio playback across web pages (popup player in a separate window and browse the web while listening to music without interuptions!). FLASH fallback included for older browsers that don’t support HTML5 audio. Optional deeplinking (unique and sharable link for the current playlist and track). SHOUTCAST support. Play your favorite online radio directly in the player, of course shoutcast playlists can be created with ease! (only mp3 stream supported). Podcasts, Official.fm and SoundCloud support. Playlist from folder, create playlists from folders with .mp3 files plus ID3 metadata detection. Support for unlimited playlists and each playlist can have unlimited tracks. Optional playlist and playlist window selector. Three type of hover effects for the playlist window selector thumbnails. Optional playlist and playlist window selector auto open (the player can start with the playlist or playlist window selector visible or hidden). Optional playlist item download mp3 buttons (this buttons can be removed/added globally or individually for each track). Using the shortcode generator one or more MSP instances can be added in post, page, sidebar or theme. Customizable playlist window selector thumbnails. Playlist visible tracks limit (choose how many tracks to view in the playlist, the rest if any are scrollable). Playlist loaded tracks limit (maximum number of tracks to be loaded). The option to start at a specific playlist and track. Powerful API included. Start volume value. Autoplay. Shuffle, loop or play next track once the current track has finished to play. Optional track thumbnail (this can be disabled globally or individually for each track). Playlist button (optional). Playlist selector button (optional). Shuffle button (optional). Loop button (optional). Optional download mp3 button located in the control bar (this button can be removed/added globally or individually for each track). Facebook share button (optional). Pop-up player button (optional). Equalizer animation (optional). Animated track title text if the text does not fit. Eigth skins included. Detailed documentation. Full product support. When viewing the player on a mobile browser the autoplay is set to false, also the volume bar is disabled. The skin is constructed from png files. On mobile devices is not possible to download mp3 files instead the download link will be sent to an email at your chosing. When the player is opened in popup the playlist if enabled it will be always visible. Improved popup functionality, once the player is opened using the popup button or the popop API method, MSP will not instantiate in any other page that has the same MSP instance, this allows to have a single MSP instance running at any given time (only available on desktop machines). Improved Soundcloud support, now MSP can load and play user tracks, single track, playlists, favorites and groups.